While both types of tape are generally made from cotton, this is where the resemblance ends. 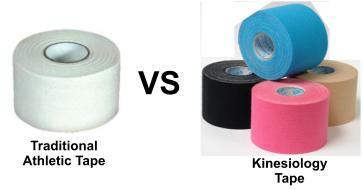 Kinesiology tape is very thin and elastic, while traditional athletic tape is thicker and inflexible. Many athletic tapes contain other ingredients, including latex and zinc oxide, which can contribute to skin irritation and allergic reactions. Kinesiology tape is make from 100% high quality cotton, with a hypoallergenic acrylic adhesive. Conventional athletic tape is almost always wrapped tightly around a joint or muscle group, completely enclosing the area in tape. A pre-wrap is generally required to help reduce skin irritation. Because there is no elasticity in the tape, this technique is used to immobilize or greatly reduce the range of motion of the injured area. Kinesiology tape, on the other hand, is seldom wrapped completely around any part of the body. Instead, it may be applied across an injured area and/or along the boundaries of the injured joint or muscle group. This type of taping can be used to limit unhealthy movement patterns, but still allow full range of motion within healthy limits. Because traditional athletic tape creates significant compression of injured tissues, it can limit both blood circulation and lymphatic drainage. Skin irritation can also occur due to poor breathability, heavy adhesive and friction. Thus, it can only be worn for short periods of time. Because kinesiology tape is both flexible and breathable, one application can be worn for several days without skin irritation or other complications. The bottom line … for rigid support of injured or unstable joints, conventional athletic tape is indicated. For all other therapeutic requirements, kinesiology taping provides superior benefits.